For over three decades I have led innovation teams designing human centred solutions for the modern world. From experience with some of the world’s best creative teams, I lead digital and innovation projects for business, public sector and government organisations. Through discovering real human need and context, collaborating across organisations and co-creating with people, we can together create solutions that deliver impact and transformation. Design is a set of ideas that help us think about what shape we want the world to be. Design is something that we can't avoid, it's all around us as decisons that are made about the objects, information and spaces we live in. When design is done conciously and well, it makes life easy and we see beauty. When design is done without care, or too late, we get an unusable, akward and frustrating world which we find ugly. "Clive Grinyer has been a passionate advocate for the transformational potential of design for some three decades. Today’s focus on the value of digital product design and on design’s value in leading customer experience in the UK is, in large part, due to his work." For cities and citizens, users and consumers, employees and customers, we can design better experiences, use technology more wisely and beautifully and ensure access to all. Building on a career heading design teams for Barclays, Samsung, Orange, Cisco, technology startups and design agencies IDEO and Tangerine (which I founded with Martin Darbyshire and Jonathan Ive), I bring design thinking to the heart of organisations. Finding the epiphanies in customer insight, analysing problems and opportunities and bringing creative techniques to co-create, collaborate and inspire all to find innovative new solutions, design transforms people and organisations and delivers real impact and change. Designing innovative new services and improving your customer’s experience requires insight into your user, your own people and the systems they work with. With the best research, the ability to turn insight into creative opportunities and the knowledge of commercial and operational reality, you can create the blueprint to transformation and successful customer engagement. Providing full service service design consultancy with access to brilliant researchers, digital and omnichannel expertise and creativity, I create the right teams to deliver transformational results. I help organisations think strategically and use design to shape how you co create and collaborate, build great innovation, technology and digital teams and change the culture inside your organisation to focus on customer experience and impact. I set up the service design team within Barclays UK Retail Customers. The team drew on customer data and insight and used design methods to create solutions that delivered transformation change for both areas of high customer complaints and the development of new services and propositions. The Design Office was set up to develop digital innovation and I ran a number of projects including Smart Investor, Artificial Intelligence and Fusion Threat Intelligence. This took data of e-crime and service attacks from hackers around the world and is visualised in terms of business and organisation impact for senior managers. As part of Cisco Consultancy, I developed solutions to business and customer experience problems for their largest clients. The John Lewis StyleMe fashion mirror created a physical and digital experience for store shoppers to explore the full online store with 3D cameras projecting the clothes on to the customer’s image on screen. Samsung used design at the heart of their brand strategy to enter the European and US markets. Having run a US studio as part of IDEO in Palo Alto, California, I moved back to set up a European team in London. I recruited a talented team who went on to win international awards for consumer products from vacuum cleaners to TVs including Samsung’s first mobile phone for the European market. I founded Tangerine with Jony Ive and Martin Darbyshire. Tangerine initially designed for international companies including Apple and LG as well as smaller UK manufacturers and have gone onto to become one of the UK’s most successful international innovation consultants. The designed the first business class bed for BA and have gone on to become world leaders in transportation design. The UK’s leading organisation on design, I developed “design immersion” programmes imbedding design into technology and manufacturing companies. The scheme has been rolled out to thousands of companies across the UK. I also ran the Design For Future Needs European Research Network project looking at how design could assist with Foresight and public policy setting. Excellent to meet the design team at @this_is_bud on Friday, talked about thoughtful banking and design with @DollyEniola and friends. Last month I have been in New York with Policy Lab and Dubai, holding a Service Design Masterclass for a major retailler. 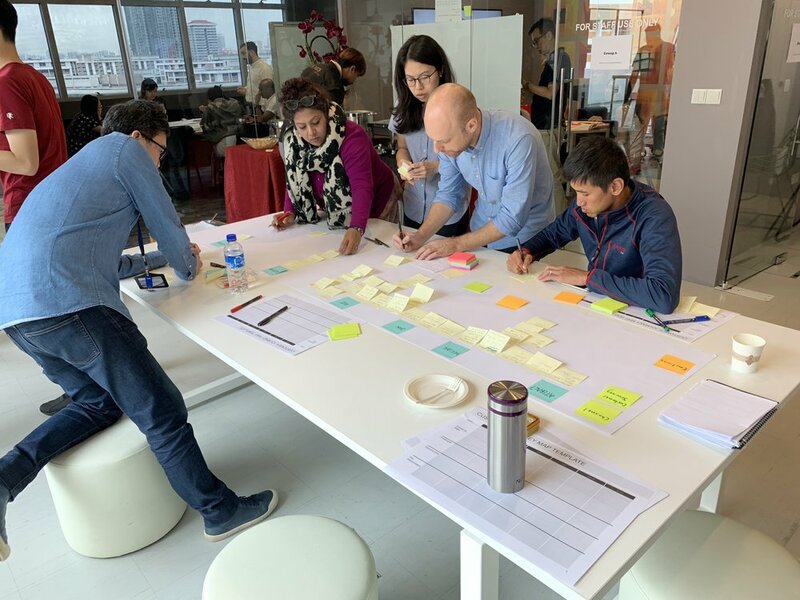 In November I travelled to Singapore to give a 2 day MasterClass in Service Design to an enthusiastic and knowledgable audience of corporate and government senior managers. We are able to bring service design to life with examples from Barclays to the UK Policy Lab. Taking their big challenges, we worked to generate innovative and practical solutions to take back to their colleagues.